REACHED from the heart of the metropolis by a 28-minute drive over a route which crosses the famous Triborough Bridge and leads to the site of the 1939 World’s Fair, North Beach Airport in the Queens section of New York, N. Y., is being enlarged in area from 105 acres to 429 acres and will be provided with every facility for the handling of giant transcontinental and transoceanic air liners. Exclusive of land, the construction cost of the enlarged airport will represent a cost of about 12 million dollars. 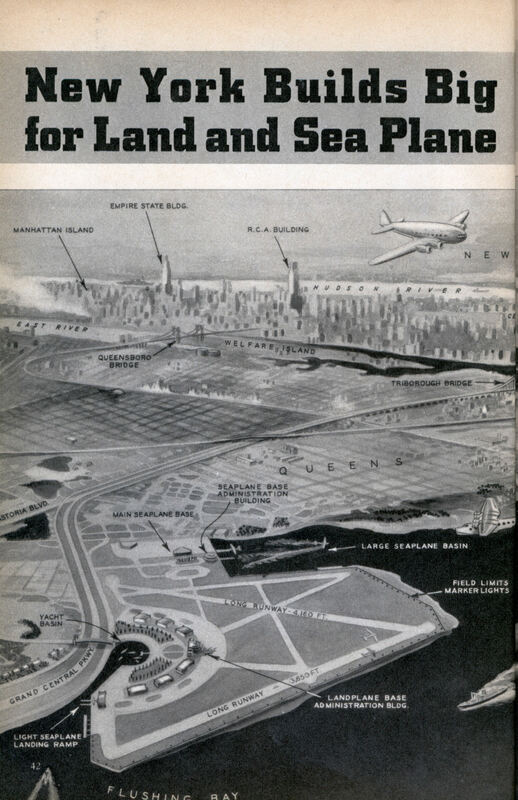 The completed airport, as shown in the artist’s sketch at left, will feature four main runways, one of which will be 4,160 feet long, to accommodate land planes while a vast seaplane basin will provide landing and takeoff facilities for flying “clippers.” Plans for the reconstruction of the airport were prepared by engineers of the Works Progress Administration in co-operation with the city’s Department of Docks. The airport’s hangars and administration buildings will represent the latest ideas in airport architecture. Only 28 minutes from Manhattan!